Gerry humidifier filters remove mineral pollutants from the water entering your humidifier to keep your home's air clean and fresh. 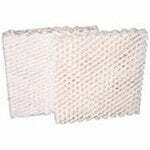 The Gerry 650 Humidifier Wick Filter 2-Pack offers honeycomb filtration to trap mineral pollutants found in water. The Gerry 650 Humidifier Wick Filter comes in this cost-cutting 2-pack package.